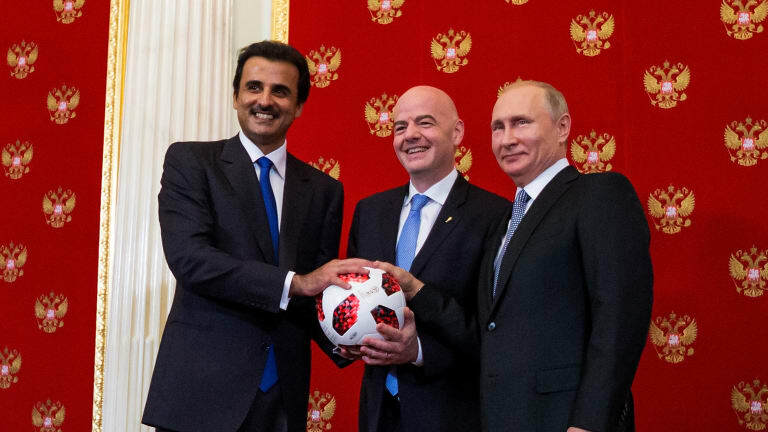 The Russian President Vladimir Putin symbolically handed over the organisation of the World Cup to the Emir of Qatar a few hours before the kickoff of the final of the World Cup in Moscow. The president handed a football to Sheikh Tamim bin Hamad al-Thani. He is convinced that Qatar will organise the World Cup in 2022 just as well as Russia, as Putin told press agency Interfax and he then offered his help. Putin also received the heads of state of the finalists, the French president Emmanuel Macron and the Croatian president Kolinda Grabar-Kitarovic before the World Cup final.